What will we invest it on? Increasing infrastructure spend to ease congestion, improving housing affordability and cleaning up water quality in our streams and beaches, while ensuring rates are kept low, will be Mayor Phil Goff’s key priorities in Auckland’s 10 Year Budget. “This 10 Year Budget will see Auckland Council’s transport infrastructure spend increase to $11 billion over the next decade. The investment is critical to ensure our city, with increasing population and cars on the road, doesn’t grind to a halt,” said Mayor Phil Goff. “We’re working with Government to introduce a fairer revenue source in the form of the Regional Fuel Tax. This means we can remove the $114 Interim Transport Levy which doesn’t raise enough money and is unfair in how it impacts on retired folks and others who make less use of our roads. “Accelerating investment in our transport network is critical to address congestion and to allow the development of brown and greenfields sites to increase the supply of housing. “I pledged to keep rates low by finding efficiencies and that is exactly what we have done over the last year, including through Council’s ongoing Value for Money programme. This means we can keep the increase in average general rates at 2.5% for the next two years. “We are committed to finding further savings, while ensuring that we can maintain service levels in the face of unprecedented growth. “A new set of performance measures for the Chief Executive agreed by the Governing Body last week will, among other things, aim for a 30% reduction in Council’s travel budget, and set agreed ceilings in key budget and staffing areas. “We enjoy a beautiful environment in Auckland but years of underinvestment are putting that at risk. To meet critical concern in this area, I am proposing a small targeted rate to tackle problems that we need to urgently address. If adopted, there won’t be a noticeable impact on rate levels for the average ratepayer as it adds up to slightly less than the Interim Transport Levy which is being removed. “A targeted rate on water and the environment together could come to about $1.70 a week. For that we can clean up our streams and beaches, protect our Kauri, our forests and native bird life. “A targeted rate is also transparent so Aucklanders know where that money is going and what they are paying for. “This Budget reflects that the costs of growth puts real fiscal constraints on which Council can spend in other areas. There are many other things we would like to do but are not possible in a constrained environment,” said Mayor Goff. 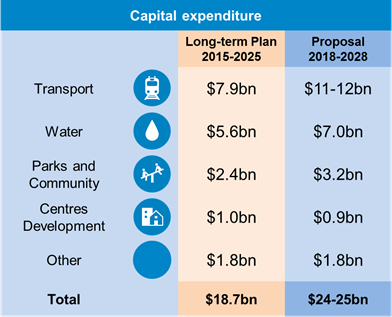 Increased Council spending on transport infrastructure to $11 billion over the next decade funded in part by the introduction of a fuel tax raising $130 to $150 million each year. Removing the $114 a year Interim Transport Levy on 30 June 2018. A residential property at an average value of $1.08 million will pay a net increase of 1.4% when the ITL is removed. This is after the general rates and targeted rates increase are taken into account. Targeted rate of less than $1.30 a week to help achieve at least an 80% reduction in wastewater overflows into our harbours within a decade by delivering water quality infrastructure improvements through a Water Quality Targeted Rate. Addressing the rating classification of online accommodation providers including a new rating category, based on the number of nights booked. Managed divestment of certain assets like the Downtown Carpark and Graham Street property to increase funding available for community facilities, city centre and waterfront projects. Continue value for money and efficiency drive in Council spending and operations. Seek additional funding tools from Government for Auckland to invest in its infrastructure and manage unprecedented population growth. Radio NZ is report it as a “Auckland ratepayers could face 6.2 percent hike” after the Interim Transport Levy is taken off but a suite of new targeted rates are added on. The question is do we spend to get the City up to speed or still be stingy while critical infrastructure still lacks. You have until next year to decide when the 2018-2028 Long Term Plan comes out for submissions.